Our second day in the heritage city, started with at a leisurely breakfast at the hotel. 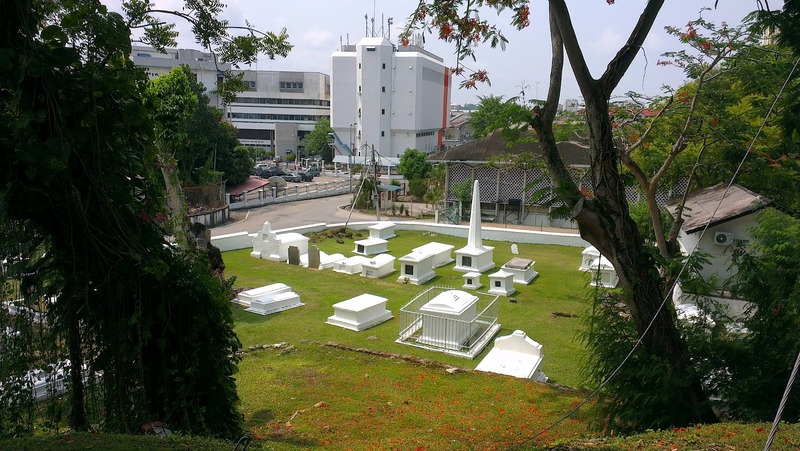 A word of caution, since Malacca is a family tourist spot, be prepared to be swamped with noisy children at ALL times at family hotels such as the Holiday Inn. Me taking a pic of the wall! 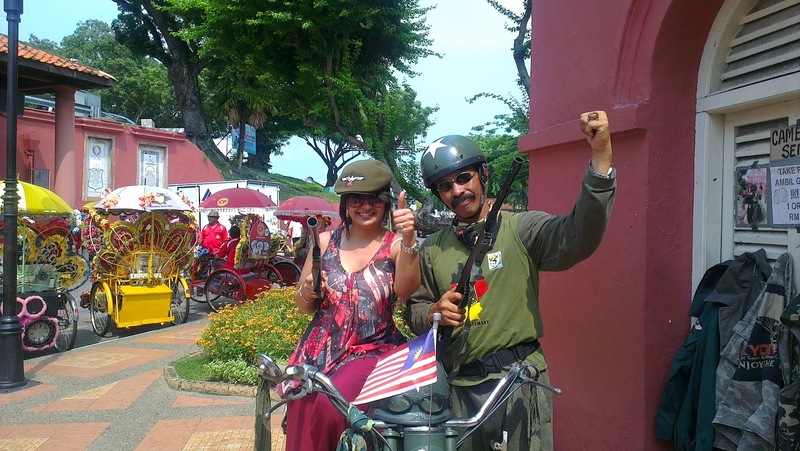 After the sumptuous breakfast buffet at the hotel, we set out to experience the sights and sounds of Malacca. 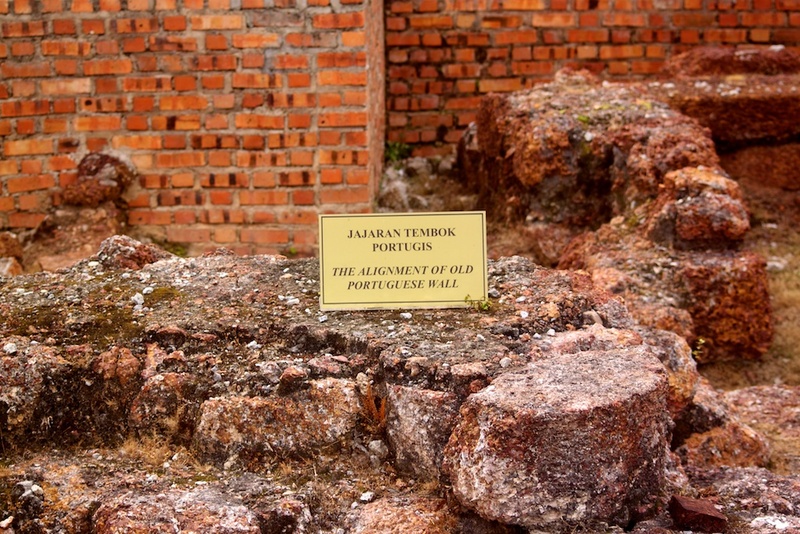 Our first stop was the remnants of the old Portuguese wall, which isn’t really as eye-catching as some other walls, but has it’s significance in the history of the city nonetheless. What was noteworthy was the array of canons right across the new street from the remains of the old wall. 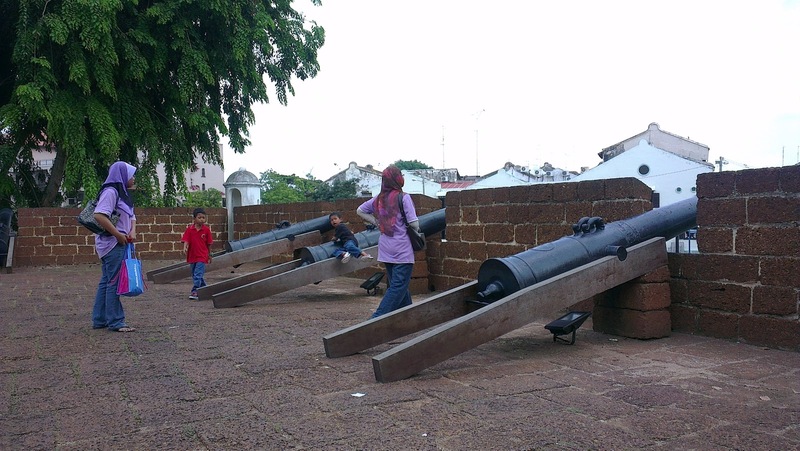 We found a number of tourists posing along side these magnificent war-canons and for good reason! Check out the grandeur of these babies! 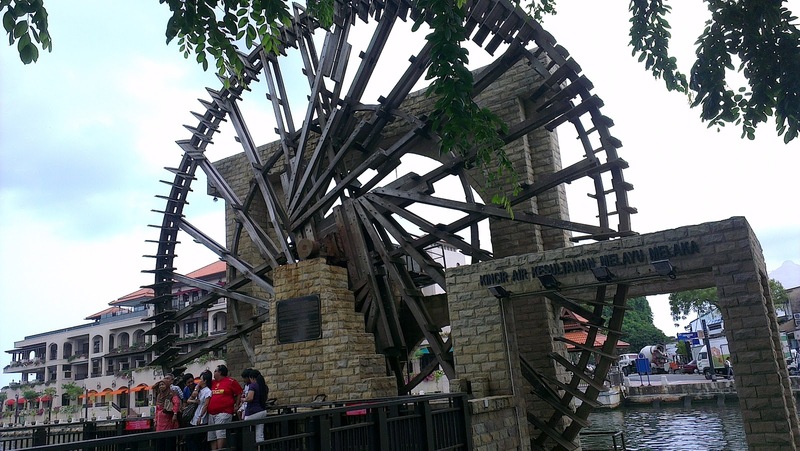 Another attraction close to the wall and the cannons is the Malacca Ricer WaterMill. When I say attraction, I purely mean for photographic purposes cause you can get some really neat snaps with the watermill as a background. Our next stop was at the famous Stadthuys. 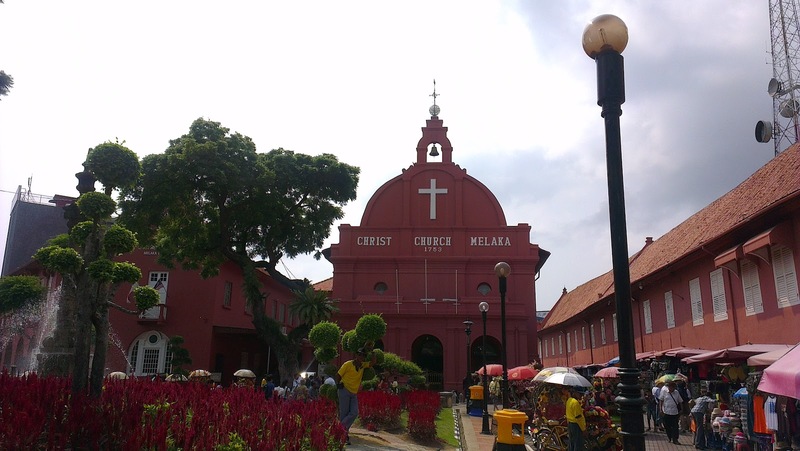 The most prominent structures in this city square are the Melaka church, the administrative building, the fountain and of course the clock tower. If you’re a photog like me, you could spend an entire afternoon here and still not be satisfied with the number of shots you would have taken on your camera. This place is THAT awesome! There is also this one supposed war veteran sitting at the base of the clock tower with an array of war memorabilia who let’s you take funky pics like this one for nominal fee of 3 Ringgits. I am not sure how many he’ll let you click but I was able to take about 3-4 before it got a little repetitive. The alley ways around the church are lined with shops aimed at the average tourist selling refreshments and memorabilia alike. 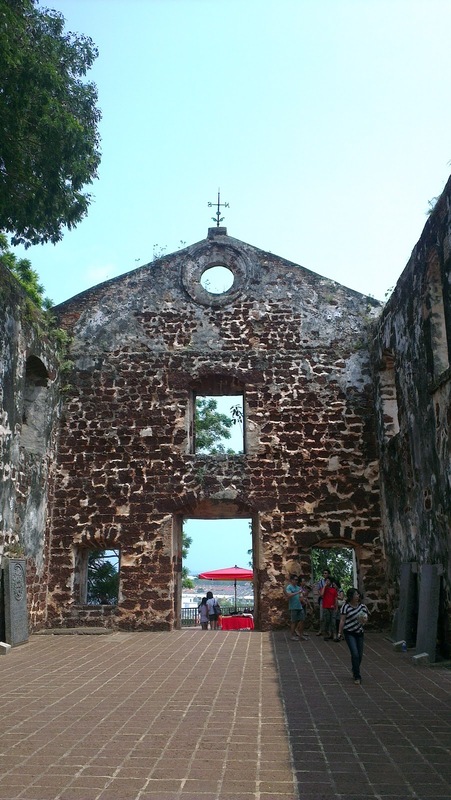 Next we made tracks to the other famous church in Malacca, The Church of St. Francis Xavier. 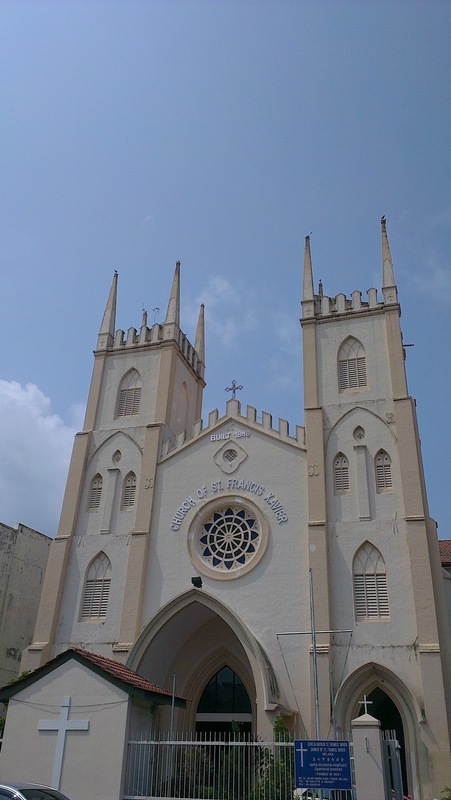 Those of you who have been to Goa will instantly recognize that name because there’s a church with the same name there as well. It so happens, that the two churches share more than just their names! The church looks absolutely stunning from the outside and is equally eloquent on the inside. 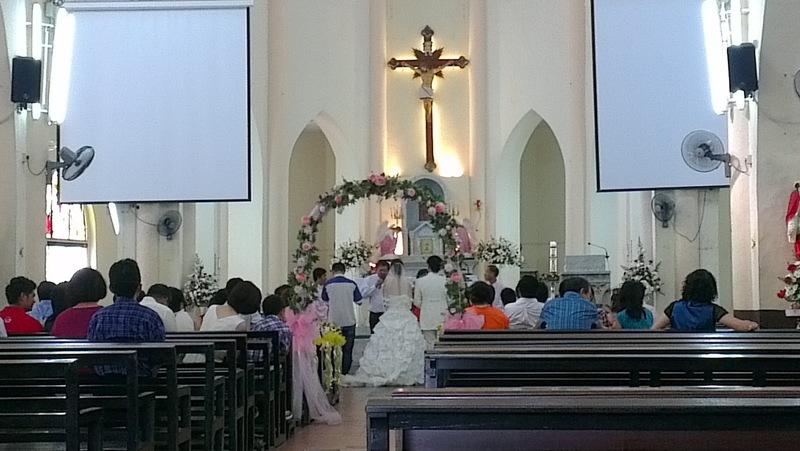 We were even fortunate to witness a wedding in progress as we entered the church. 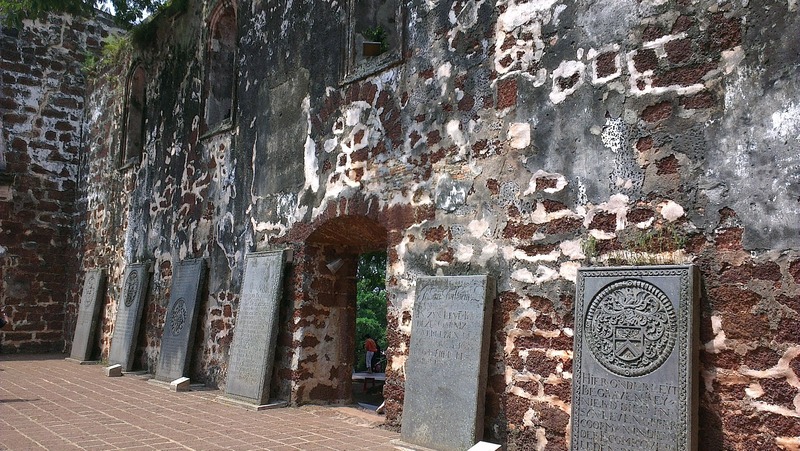 By this time we were beginning to feel the heat of Malacca and boy was it HOT! And what better way to beat the heat than with a nice delicious cup of ice-cream. So we made a quick pit-stop to savor a local ice-cream favorite, icily. 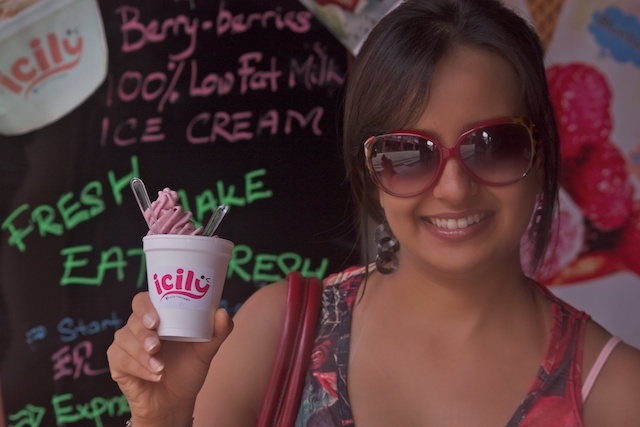 Icicy is quite conveniently located close to the city square and the St. Francis Xavier church. Using fresh fruits, a type of preserved low-fat cream base and quite a funky contraption that melds all of this together, the kind lady at icily concocted a delicious cream frozen dessert for us. The dessert was bursting with natural fruit flavors and it made the ice-cream simply irresistable! Before moving onto the next attraction that we went towards, let me share how we got there. So after coming out of the church and grabbing the dessert we decided to blindly explore the back alleys of the Stadthuys. Which turned out to be a bit of a bummer since we ended up in a kinda eerily empty spot of the city with stairs ascending to a crude structure on a hill. And to make matters a lot more interesting, the picture to the left was the view going up. Suffice to say, we were kinda spooked till we reached the top of the hill and discovered this – St. Paul’s church. Turns out we had taken an less frequented route to head uphill, cause the place was swamped with tourists. The church is essentially a ruin but still looks quite majestic. 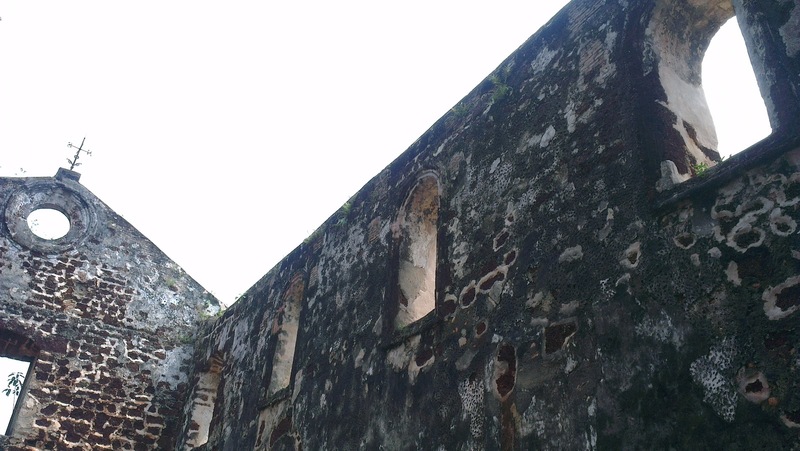 There is no roof but the outer walls and most of the inscriptions are intact, and even some tombstones. Again, you’re bound to get some really great snaps for your collection. We sure did! Descending from St. Paul’s hill brings you smack in the middle of a long line of a variety of museums dedicated to philately (pertaining to stamp-collection and other postal for the uninitiated), the ruling political party, one on architecture and also another on the heritage of the city. 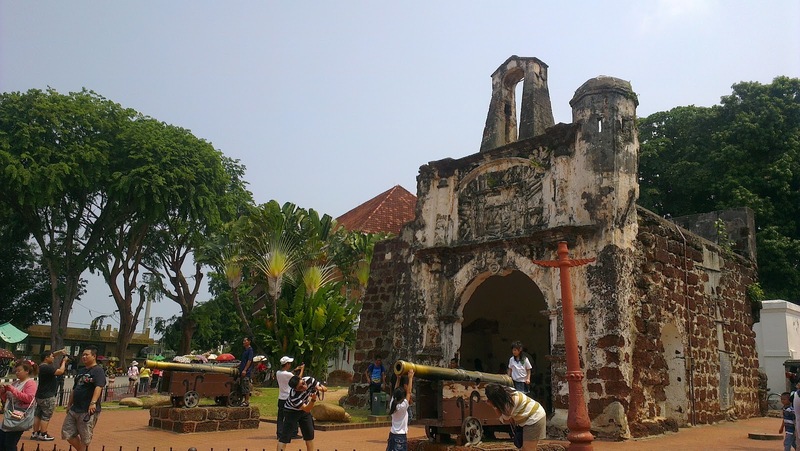 Before you do walking towards the multitude of museums you’ll notice another pretty photogenic landmark called A Famosa (which means in Portuguese), a fortress remnant from the Portuguese era. 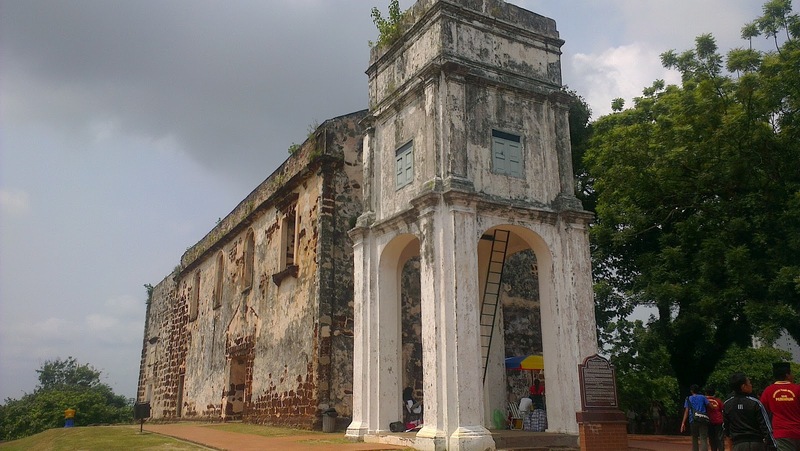 This structure earns the distinction of being one of the oldest surviving European architectures in Asia. That’s it for this blog post. 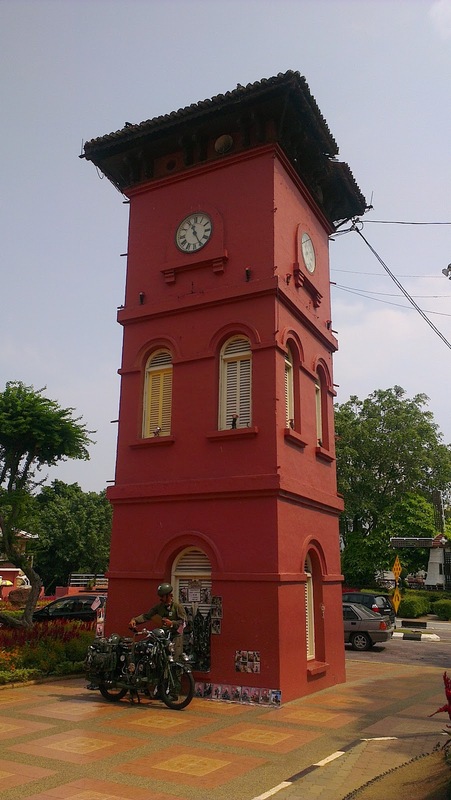 I know I promised I’d talk about the shopping escapades in Malacca in this post. But the chronicles so far have taken up a LOT of the post space. So the next (and hopefully final!) 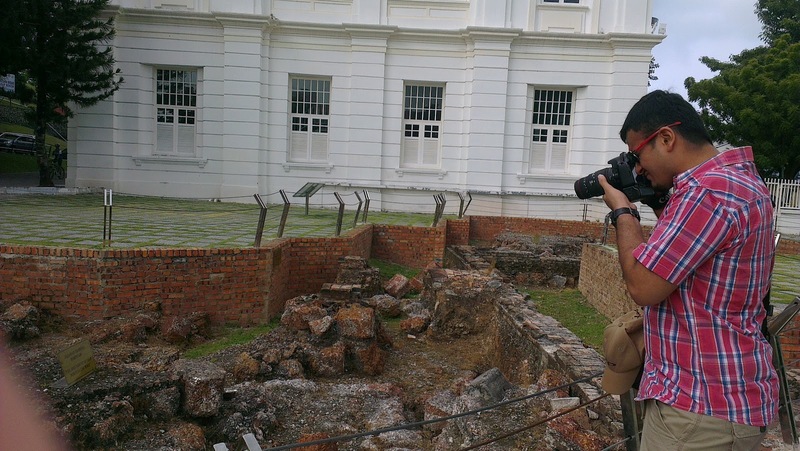 part in the series will focus a LOT on the shopping escapades at Jonker and other great places. Till then, happy reading!